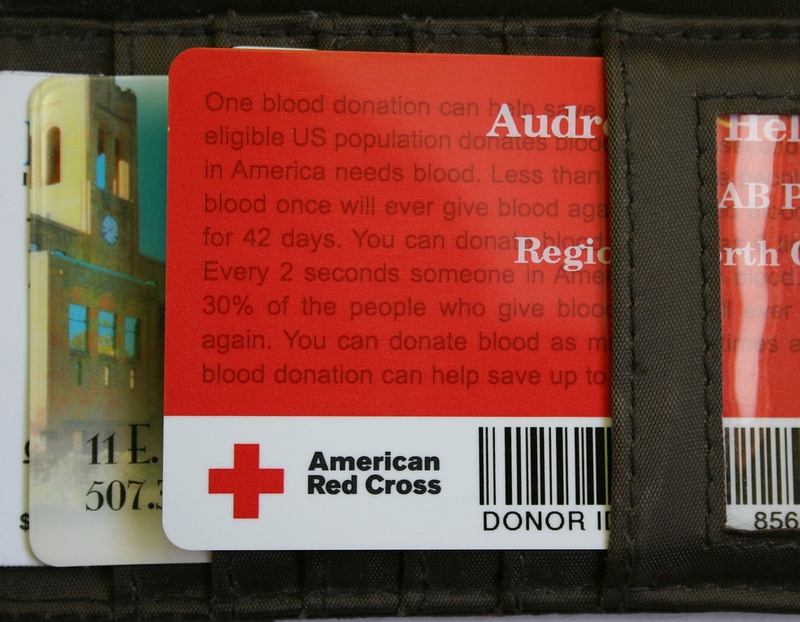 I’d never thought about blood donation in that specific personal frame until recently, when I gave blood at an American Red Cross blood drive in Faribault for the third time in my life. In eight minutes and eight seconds, I filled a plastic bag with one unit of life-saving blood. Why haven’t I donated more often? I offer no excusable explanation. But when the woman who had taken me through the entire hour-long process of preparing for and donating blood thanked me with those five words, I committed then and there to giving more frequently. My mother, after all, was saved some 10 years ago by massive transfusions of blood. That memory of her near death weaved through my mind as blood flowed from my vein. Personal experiences often influence our words and actions, fuel our passions and opinions. Adding to that personal connection and the “you saved three lives” was the discovery that my blood type, AB +, ranks low in the general population. Just three percent of Caucasians, like myself, have AB + blood. My blood can only be given to those with the same type. But I can, thankfully, get blood from anyone. If you can’t donate blood for health or other reasons, you can still help. Take my friend Tami. She worked the refreshment table, making sure donors were properly fed and hydrated and doing OK before leaving the donation center. She’d rearranged her work schedule because the Faribault collection site was short of volunteers. That’s to be applauded. Here’s the real clincher, though. Tami can’t handle blood and needles. She’d likely pass out if she attempted to donate. That came as a surprise because Tami came over to talk to me while my blood flowed into the collection bag. She displayed not an ounce of fear. I had no clue. Only afterward, when my friend waited on me and other donors at the refreshment table, did I learn the truth. To set aside one’s personal anxieties to assist in the process of saving lives impresses me. HOW ABOUT YOU? Have you ever donated blood or volunteered at a blood drive? As an extra incentive, the North Central Chapter of the American Red Cross will enter the names of all donors who give blood between February 9 and 28 for a chance to win an iPAD mini. So glad you can (and do) give blood. I have a record card nearly full from my blood donations, but sadly about 4 years ago they stopped allowing me to give blood. I’d eat a dozen cookies and a quart of juice afterwards and still had too many fainting episodes. I have some factor that they would extract for premmie babies, so it was a hard decision to have to come to. Bless you, Marilyn, for your many years of giving. Think of all those sweet babies you helped. How wonderful that you could give for as long as you did. They are always looking for volunteers. My 82-year-old mom volunteered all the time at the blood drive in her rural Minnesota community until she moved into a long-term care facility last spring. Thank you. My mom has always been an active volunteer for many organizations and activities. She has a heart of gold. Oh, I know you would donate in a heartbeat if you were able, Beth Ann. But you did help by donating those cookies. Thank you. 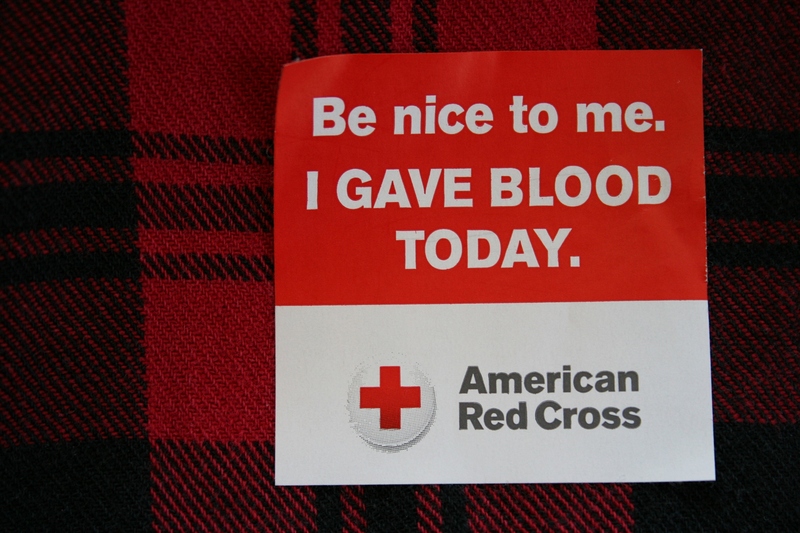 I give as often as I am allowed (every 58-60 days I think; depending if it is whole blood or double red draw). I never forget or have to think about it really as the next appointment is set before I leave from my current appointment . O neg is one of the rarer types. It is also universal and needed in great supply. I feel compelled to do so given my type. Giving blood is one of the simplest things to do really. As you have noted, giving typically takes under ten minutes. It is a meaningful feel-good thing to do. If you have never or don’t donate often, please consider doing so. You never know when your life may depend upon someone else giving blood. Thank you, Dan, for generously giving your blood without even thinking about it. Imagine how many lives you have saved. The first donation I gave was 45+ years ago at a time when DH’s mom was in need of many transfusions and family members could replace the units she used by their donations. The Mpls Blood Bank has, since, changed some of those requirements thankfully. I was told that my type (B+with it’s sub-groups) was rare enough that they preferred to put me on a donor list “on call”. Interesting! Great reminder post!!!! My father-in-law also has a rare blood type such that he would be called on an emergency basis to donate. I’m so glad that the situation for replacing blood that a family member (or yourself) has used has changed. It used to be that a patient would be charged for each unit unless it was replaced by a family member!!!! I had no idea. Good thing, for sure, that the rules changed. Seriously, giving blood, working at a water station on a Cancer Walk, mopping the floor after a Lion’s Pancake Breakfast, all these things say what is good about us. It is easy to lose sight of that – because it is so common. Monica, cousin Sandy and I are all AB+. In fact when high school science class could still do blood typing our teacher made Sandy and I retake the test because AB+ is rare and we were table partners. Once he found out we were cousins he believed we both had taken the test. I have given blood since college and have some years where I just didn’t. Glad you are giving. Well, I just learned something new today about you and my other sister and Sandy. Thanks, Lanae. And thanks for giving blood for all these decades. Colin did that last week. I can’t because of living in Europe in the 1980’s- mad cow disease. But at least Colin can save lives! The last time I tried to give blood, I could not because I had lived in England for over a year. PS. I love that you are giving back..
Alright, two comments in a row here from readers like you who can’t give because of living in Europe and the whole mad cow disease issue. My questions: How are blood donations handled in Europe then? Are donor screened for mad cow disease? Love your nurse’s sense of humor. I’ve donated blood, although it’s been quite a while. My veins, small and fine, roll and are difficult to get a needle into. Not that that should stop me. Thank you for the reminder that giving blood is a very important contribution to helping others! And those people who work the refreshment table are really important too; last time I gave, I nearly fainted. I was so glad to get a cookie and some juice! I understand your reluctance given the challenges. Thank you giving when you can. Yes, I have donated twice and should do it more often. They are doing blood drives more frequently in my area so I’m sure I will. My husband does it much more often. We both are A+. I watched a young man keel over at the refreshment table last time. Young and fit as a horse, but he turned kind of green and had to be eased into a chair for a half hour. He was fine afterwards and a bit abashed. Hmmm, seeing someone keel over would prove a tad unnerving. Thank you to you and your husband for donating blood. My first comment to your blog, Audrey. I started donating blood after my son donated a portion of his liver last May. The recipient (a teenage boy) needed a couple transfusions. After seeing what my son went through, I figured it’s the least I could do for others. I am B+ so my blood is needed, and the procedure is quick and unbothersome (a word?) to me. As small as an effort this seems, I know I am helping in a way that I am able to. I now give on a regular basis and it sure is a good feeling knowing I am helping others. I appreciate all the employees who participate in this human-saving endeavor. And, I applaud anyone who has helped in any way to give the blood, transport the blood, get it into the person who needs it, etc. Lori, welcome to the comments section. I’m always delighted to hear from my readers. Thank you to your son for donating a portion of his liver to a teenage boy. That epitomizes the definition of giving. I hope both your son and the recipient are doing well. I’m sold! Next blood drive I will donate! You gave when you could, Jackie. Thank you. And every time you go to work, you are helping people not only via your skills but with your compassion and genuine care. Thank you, DeLores, for all the volunteer work you have done for/at blood drives. Those are important tasks and you are appreciated. Oh, Charlie, I’m sorry to hear that Drew has a health issue that requires this, especially when he can’t donate the blood. Thank you for giving blood all those times when it was in short supply at the hospital. What a gift. Jon and I gave blood many times in the past, but awhile ago they added some questions in to their list that prevent us from being donors. Living in Germany in the 80’s…. We may have mad cow disease….. No way to test the blood at this point so we are unable to give. Note: while in the US it is common to get coffee and cookies, it is common in Germany to get beer and brats! Much better deal. Jon actually received a beer mug for donating one year, the mugs were gone when I went through that time. 8 minutes to fill a bag – pretty quick. I drain pretty slow, a nurse in Germany gave me coke once to speed it up! Coke as in Coke, right? It took your brother 12 minutes to fill his bag. You will be interested to hear that in New Ulm, so Randy was told at the blood drive, donors get beer. I have not confirmed, so do not know if that’s accurate information. Maybe root beer? Thanks to you and Jon for donating while you could. You are now the third mad cow disease commenter here.